This two tone beauty is our Board Copper Bath. It has a fine black finish exterior that compliments the polished copper interior. It’s a compact elegant bath, popular with our customers. Forget about life outside and sit in this gorgeous bateau tub bath that combines modern with classic industrial, giving you a bath that will fit in with every kind of decor, whether it’s modern or something more traditional. It’s a stand alone bath that wraps itself around you, giving you the ultimate in originality and luxury. 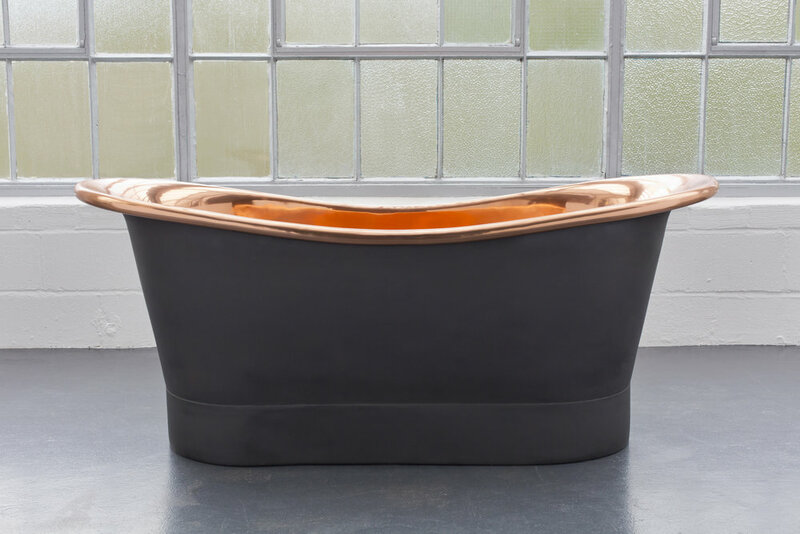 As with all our baths, the Board Copper Bath is made with high gauge copper, hand beaten, polished and sealed. All these methods help to create an original, heard-wearing uniquely designed bath. They come in standard sizes (l)1700mm x (w) 705mm x (h) 710, but you can have any size you require. If the bath you want is not in stock and you don’t want the standard, we can create one specifically to your requirements, taking around 8 weeks to manufacture and deliver.